PHOENIX -- Shaquille O'Neal took the job of All-Star host seriously. And for him that means hardly serious. The Big Shaqtus joined a freestyle dance team during pregame introductions Sunday to set the mood on a night when freestyling takes center stage. 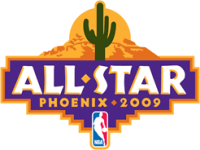 The All-Star Game is about the NBA's best doing their thing for 48 minutes before a packed house and millions around the world. O'Neal and his former sidekick, Kobe Bryant, did that, putting a fitting bow on the evening by sharing MVP honors as their West squad blasted the East, 146-119 (Highlights | Box Score). While jealousies and drama tore Shaq and Kobe apart years ago, there was nothing but love Sunday at U.S. Airways Center. They shared the stage at the end, too, each grabbing his third All-Star Game MVP award. Bryant put this pairing with The Big Legendary in perspective. "We're not going to go back to the room and watch Steel Magnolias or something like that, you know what I'm saying, crying, all that stuff," Bryant cracked. "We had a good time. That's all." Bryant led all scorers with 27 points. LeBron James paced the East with 20. But it was O'Neal, the self-proclaimed "Godfather of the NBA", who owned the highlight of the night. The third-quarter delight began at the 3-point line in a matchup of one-time Orlando centers. The Magic's first All-Star center (O'Neal) passed the ball through the legs of the latest, Dwight Howard, and into the waiting hands of West teammate Chris Paul. O'Neal took the return dish and nearly took the basket down with a two-handed ferocity. The fun didn't end there. Two slams later, Shaq decided to do pull-ups on the rim. Working against East backup "center" Rashard Lewis, the dunks kept coming and the West's lead expanded accordingly. Kobe helped set up a few of O'Neal's signature scores. "It felt like old times," Shaq said wistfully. "I miss those times. He was really looking for me." Shaq finished with 17 points and appeared to concede the MVP to Bryant when the man who coached them to three titles with the Lakers grounded O'Neal in the fourth quarter. Jackson, completing the LA reunion story, didn't clip Kobe's wings. No. 24 checked in midway through the final period of a blowout while the hometown hero watched from the bench. Unlike the old days, a controversy didn't ensue. According to the East's Dwyane Wade, teammate Allen Iverson predicted the co-MVPs. With a tinge of irony -- considering he set the playing rotation -- Jackson was surprised that Shaq kept half the award. "That's the first time I have seen an MVP that played 11 minutes in an All-Star Game," Jackson said. "But he really had an impact on the game. There is no doubt about it." For those who criticize the fans' job in selecting the All-Star teams, the buzz in the building was clearly up a notch with the starters on the floor. Shaq, 36, is still part of the must-see crew, even on the tail end of his career. And this may end up being his All-Star swan song. "Whenever he decides to unlace the shoes, the game will be missing without the big fella," James said. "He brings gamesmanship, sportsmanship, laughter. He brings everything to the game of basketball. The game will miss him." Though the intensity in the building seemed to be missing when the reserves took over, the action on the court stayed brisk. Two backups -- Paul Pierce (East) and Pau Gasol (West) -- hit double figures by the half. The midseason classic also lacked the usual array of alley-oops and long-range marksmanship. Already lacking in size (especially with the injured Chris Bosh sitting out), the East hoped to make up the difference by bombing away. The losing side bombed, missing 26 of their 34 3-point attempts. The East starters paid their respects to Bill Russell before tipoff. All five made a point to shake the hand of the league's ultimate winner, who had the Finals MVP Award named in his honor Saturday. Russell, 75, then received a surprise birthday cake during a first-half timeout. O'Neal and Bryant waited to the end of the night to open their present. It was worth the wait.